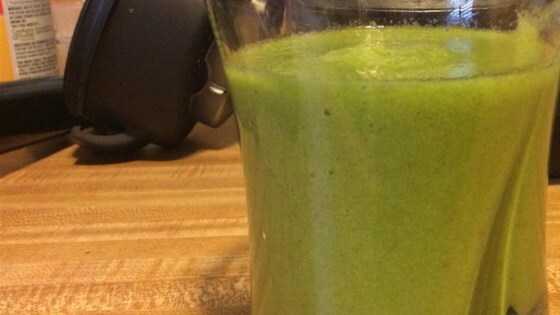 "This is a healthy smoothie drink that has raw spinach in it, but the taste is masked by apples and cinnamon. Tastes wonderful! Add water to mixture if you prefer thinner smoothie drinks." Pour apple juice into a blender; top with pear, apple, spinach, cinnamon, and ice in that order. Cover and blend until smooth. This was very good. My smoothie was smooth, but I also have an expensive blender to chop everything up. Just as the other review says, you can not taste the spinach at all. This is good. It didn't look like the picture, but the pear and cinnamon go great together. Easy to make with the ninja. Thanks for the contribution of the recipe.